In the final minutes of Auburn’s regional semi-final win against North Carolina Friday night, disaster struck. Star player Chuma Okeke went down with a non-contact injury that silenced the crowd. As he squirmed on the floor in pain, it seemed obvious to all in the arena that this was a season-ending and career threatening injury. Auburn teammates rushed to his side to check on him. Carolina players near Okeke had looks of genuine concern for their fallen opponent. Finally, Okeke was helped to his feet and assisted off the playing floor toward the locker room. As he left the floor, every single North Carolina player on the floor made their way to him to express concern and encouragement. In the game’s aftermath, social media raved about the acts of sportsmanship by the Carolina players. But the actions of these players go beyond sportsmanship. All those little things that we consider acts of good sportsmanship are things coaches can require or demand. North Carolina’s kids displayed something much more important: a high level of character. They weren’t just following a coach’s demands or trying to uphold the values or their basketball program. They had genuine concern for their fallen opponent. And you may not have noticed, but this is becoming the rule, rather than the exception. College basketball is being flooded with high character kids. If you’ve watched long enough and give it just a little bit of reflection and thought, you’ll realize it hasn’t always been this way. Think of Big East basketball in the early to mid 80’s. Dirty play, brawls, and plenty of guys that looked like they were destined for prison instead of the NBA when their college days came to an end. Academic standards were lower for college admission for athletes. Coaches regularly took chances on talented guys with questionable academics, work ethic, character, and coachability. The best example of this would be N.C. State’s stereo stealing and 500 SAT scoring Chris Washburn (who left college after one year and was one of the biggest draft busts in NBA history). But guys like that don’t even get recruited now. Why? Because the unknowns have become know. How? My guess is two things: Prop 48 and social media. Enacted in 1986, Prop 48 raised academic requirements for incoming student athletes (combination of GPA and SAT/ACT scores). The outcry didn’t take long to surface: “Prop 48 disqualifies a much larger proportion of black and low income students. ACT and SAT tests are racially biased.” The short term statistics may have loosely backed up these claims. But the short-sighted vision of looking only at short-term outcomes could have easily washed away any potential of lasting benefits. It’s pretty amazing what happens when you raise standards for young people instead of making excuses for them. What about social media? Just as higher academic standards removed some level of uncertainty for coaches concerning future academic troubles, social media of high school athletes gives college coaches a closer peak at the character of players. If a kid’s Twitter account is full of profanity, unhealthy attitude towards women, racism, etc., it’s no longer a matter of some college coach being willing to take a chance on a kid of questionable character. It’s becomes a case of no longer being recruited by anybody. Coaches make it clear what is expected. Players have come to learn what is acceptable. Simply put, I’m a firm believer that lower standards produce lower quality of effort. You can say what you want about requirement-lowering ideas like affirmative action, but you’ll never convince me that they produce anything other than the poison of meeting lowered expectations. If you demand less, you’ll get less. Good guys don’t finish last anymore. And bad guys don’t even make the team. I’m okay with that. I first saw Georgia State head coach Ron Hunter when he was injured in a post-game celebration after leading his team to an NCAA tournament berth by winning the Sun Belt Conference Tournament. I’m pretty sure his injury was the result of an embrace with his son, who happens to be a high-scoring guard on this team. In post game interviews, he seemed like a breath of fresh air. Little did we know how much better this story was going to get in the coming days. When the big dance tipped off on Thursday afternoon, instead of loosely following my bracket picks from work, I was home in bed with a migraine by the time the first game reached halftime. I was rudely awakened later in the afternoon by the loud yelling from another part of my house by my high school freshman son. I was disoriented but I knew what must be happening…….the first huge upset of March Madness. Obviously, it’s frowned upon to make loud unnecessary outbursts when dad has a migraine. But when I finally arose from my slumber, and my son excitedly told me about 14-seed Georgia State’s improbable upset of 3-seed Baylor on R.J. Hunter’s bomb in the final seconds (and Ron’s topple off the stool) I decided to withhold my wrath. I fell in love with Ron Hunter’s coaching style, his fashion style (or lack of over-concern for it), his child-like excitement, and his humility. But what has drawn me to him most is his bond with his son. It’s easy to fall in love with the underdog stories each year, as most of us do. And each year it seems that a new coach wins over the country with a colorful personality. Perhaps the most lovable thing about Ron Hunter is his absence of “swagger”. If you’re an 18 year-old prospect, maybe swagger is high on your list of coaching qualities. But if you’re just a dad, and a basketball fan and a fan of integrity, your ears perk up when a Ron Hunter shows up in the spotlight. Over and over. He loves his son. He loves all his players. His love is not based on their ability to pull out last second wins. The last second wins only provide him a national stage to proclaim his love and pride for his players. He pours his energy into taking them to a place they never dreamed possible…..with the passion of a coach and the heart of a father. There’s something special about March Madness. 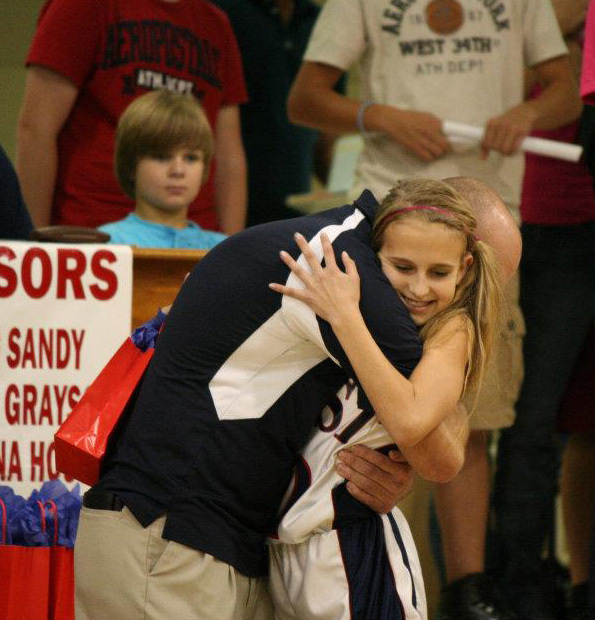 And there’s something special about a father coaching their son (or daughter). When you combine the two, it creates special moments to go beyond basketball. I’ve coached all four of my kids on some level of sports. At the end of each game, take pride in your effort. Win or lose, walk off the court or field with your head held high knowing you did all you could do to help your team win. I sat watching Georgia State vs Xavier on Saturday night, trying not to let myself get too excited about the possibility of a Ga St. win. But I couldn’t help myself. This was my team. I was emotionally attached to this father/son combination and underdog story. I found myself yelling at the TV and reacting with dejection each time Xavier made a big shot down the stretch. My oldest daughter, a freshman college soccer player was home for spring break, and happened to be the only one in the room with me as the game wound down. Ron Hunter took his son R.J. out of the game in the final seconds of their disappointing defeat. R.J. raced off the floor with his head held high, knowing he’d given his all. He also knew he’d made his father proud. Father and son embraced. All I could say was “Aww”, but I guess my voice cracked. I wasn’t the only one. In the postgame press conference what caught my attention most was the shift in Ron Hunter’s voice as he was talking about the game and his team’s unlikely postseason run. He completely broke down……..when his words changed from coach to dad. The same……but different. And so special. You can watch the interview below if you haven’t already seen it. Hope to see him back next year.